"YouTube™ On Hover" starts previewing a YouTube link once your mouse is placed on top of a link pointing to YouTube.com. The floating player is a YouTube official embedded player. By default the player is placed right bellow the link. You can change the relative positioning from the options page. To hide the player, simply click somewhere on the page. What is "YouTube™ on Hover" extension and how does it work? This extension aims to provide previewing feature to YouTube links. Using this extension there is no need to open each and every link in a new browser tab just to preview links. Just hover your mouse over a YouTube link and extension will load a floating YouTube player just beneath the link. To hide the player simply click somewhere in the page (other than the player itself of course!). To open the YouTube link in a new browser tab, just click on the title of the playing-track "inside" the player. This way player will stop its playing and you will be directed to youtube.com in a new browser tab all in once. Note that YouTube player will still continue to buffer a few more minutes of the video. To prevent buffering click anywhere in the page to let the extension completely destroy the player. How does "YouTube™ on Hover" extension work? 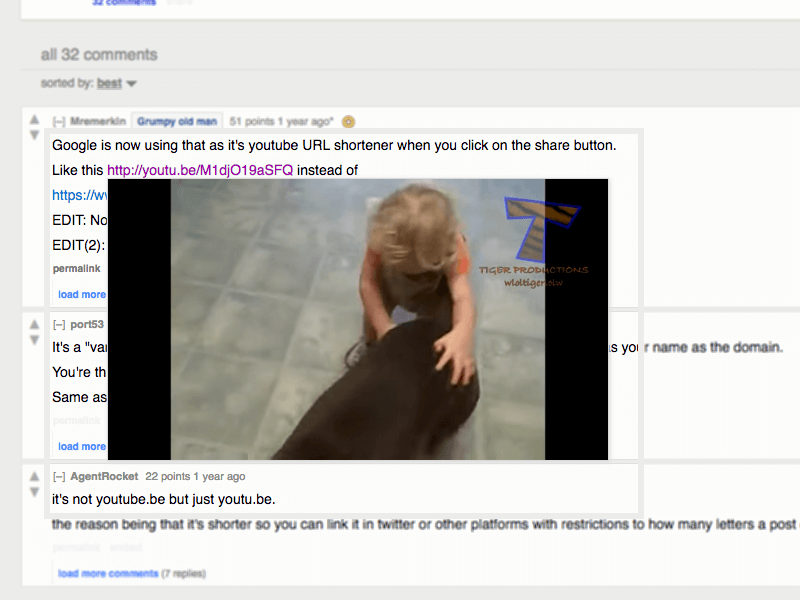 "YouTube™ on Hover" places one listener to check links when mouse is placed on top of them. If a link matches "https://www.youtube.com?watch=v*" or "https://youtu.be/*", then a YouTube player is loaded on a floating panel and auto plays the video. Can I adjust the player size? Yes, head to the options page and adjust the width of the player. Height of the player is automatically calculated based on 360/640 ratio suggested by YouTube. Can I alter the positioning of the floating player? The extension always places the player relative to the target link (the link that has YouTube url). It is possible to append left and top offset to this position though. You can define your custom relative positioning in pixels from the bottom and left side of the link box in the options page. What are the supported modes for player positioning? As of version 0.1.1, the YouTube player can be either placed in the center of the screen or at the link position (default one). By using center mode, the player is placed in the center of the screen even if you are scrolling. This is useful if you would like to browse the page while previewing the video. What is the meaning of the time delay in the settings page? As of version 0.1.1, when a YouTube link is hovered, by default it takes one second (this is adjustable) for the preview panel to opens up. This is useful when there are many YouTube links and there is a chance of accidentally hovering over unwanted links. Only links that are being hovered for at least one second will trigger the preview window. What is the "Night Mode" feature? As of version 0.1.4, you can watch previews in the dark mode. Basically, the page will fade to dark. This way you can focus more on the preview. Turning this mode on "Center" mode is recommended. Watch the "Preview" video to see all modes in action.